I enjoy giving the gift of good food during the holidays, but have yet to master the art of canning or planning ahead for that matter. 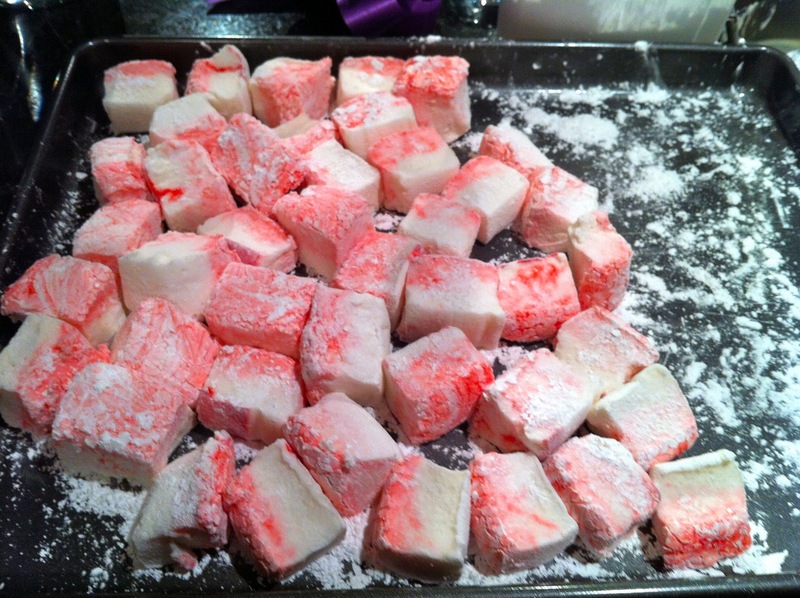 I'm an avid follower of Pinterest and pinned these candy cane marshmallows about three months ago with holiday gifts for coworkers in mind. Well, I did end up making them and they turned out fabulous. Two of these marshmallows can instantly turn a plain hot cocoa into a liquid Thin Mint. 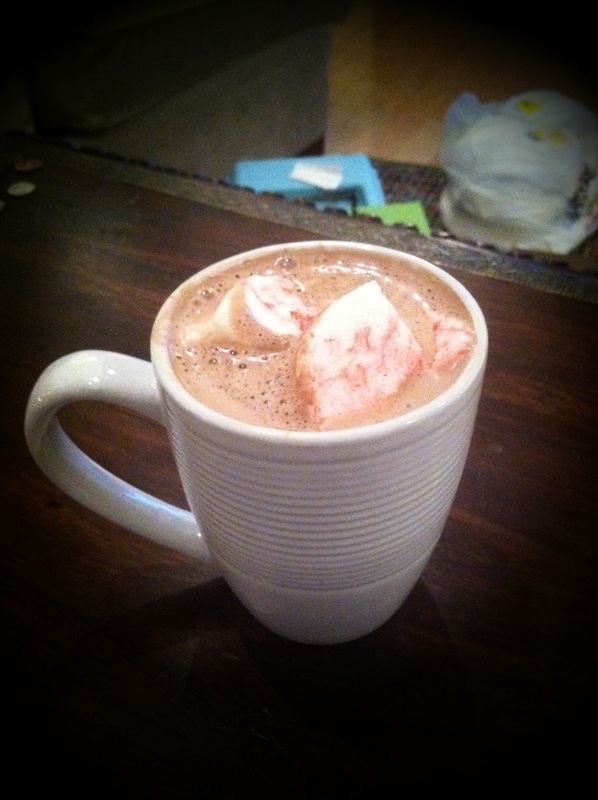 I packaged a pair of marshmallows with a packet of cocoa for a single serving warm winter drink. 1. Spray 9x13-inch pan with cooking spray, line with parchment paper, and coat parchment paper and sides of the pan with spray. 2. Cook sugar, corn syrup, and 1.5 cups water in a small saucepan over medium heat, stirring, until sugar is dissolved. 3. Once the sugar is is dissolved, you can stop stirring and cook until the mixture registers 260 degrees on a candy thermometer (it will boil a bit). 4. While the temperature of the sugar mixture rises, sprinkle gelatin over 1.5 cups water in the top pan of a double boiler and let stand 5 minutes to soften. 5. 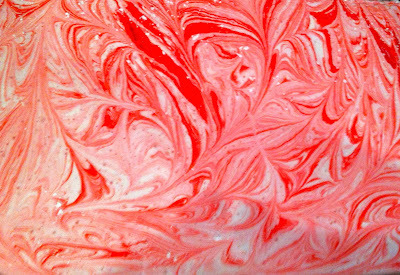 Set the pan with the gelatin mixture over a pan of simmering water and whisk constantly until gelatin is dissolved. 6. Remove from the mixture from heat and stir in peppermint extract. 7. Mix into the sugar mixture (from step #2). 8. Beat egg whites (you'll want to pull out your electric mixer for this one) until a stiff peak forms. 9. After a stiff peak forms, gradually add the sugar/gelatin mixture and turn the electric mixer to high speed for approximately 15 minutes. 10. Transfer mixture from the bowl to the previously prepared pan. 11. 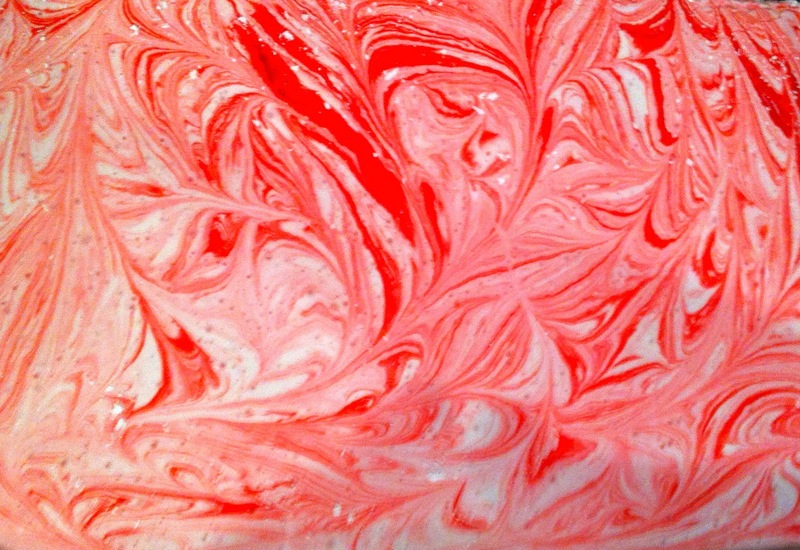 Drop dots of red food coloring across surface of marshmallow and use a toothpick to swirl food coloring throughout the surface of the mixture (see picture below). 12. Lightly dust the top of the mixture with powdered sugar and let it sit on the counter (uncovered) overnight. 13. Cut marshmallows into squares, dusting each side with powdered sugar to prevent marshmallows from sticking to one another. You may also find it helpful to dust the knife with a little powdered sugar. How to package the product: I found small clear party bags to package the marshmallows in the candy/cake decorating aisle at Michael's Arts and Crafts. Include a packet of hot cocoa and tie the package with a holiday colored ribbon for a simple and inexpensive way to spread holiday cheer (for all to hear). When you are home again please bring some of these. Your mom and I would like to try it. Maybe your mom could make a batch to bring to Kingfield.